Caption: The Second Dimension: Twentieth-Century Sculptors' Drawings from The Brooklyn Museum. [06/25/1993 - 09/19/1993]. 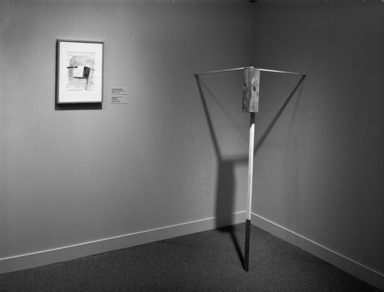 Installation view: 'Dog Catcher (Levitation)' and 'Untitled,' 1987. Al Taylor. Gifts of Susan Lorence. Citation: Brooklyn Museum Archives. Records of the Department of Photography.